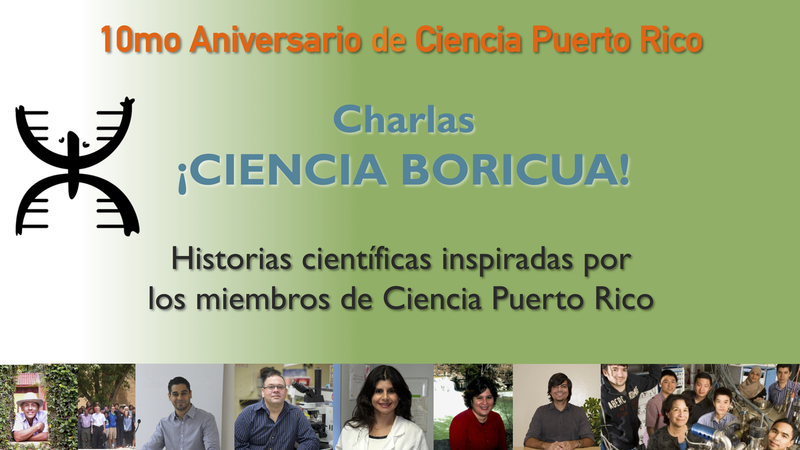 Ciencia Puerto Rico is celebrating! The year 2016 marks the 10th anniversary of our organization. To celebrate we are offering a series of talks entitled Ciencia Boricua (Puerto Rican Science)! : Stories inspired by members of Ciencia Puerto Rico. Through these talks you will learn why Puerto Rico is considered scientific paradise. You will also have the opportunity to interact with Puerto Rican scientists and learn hear about their work. The Ciencia Boricua! series is inspired by one of our greatest achievements: the book Ciencia Boricua!, in which we presented science "in rice and beans" and highlighted the protagonists of Puerto Rican science and the importance of science in Puerto Rico. The talks will take place from March to December 2016. All lectures are open to the public free of charge and will take place at the Museum of Wildlifeof San Juan at Avenida Kennedy (map). Come with your family, your friends, your students, your colleagues, or members of your community and learn about Puerto Rican science! Teachers and educators can get professional development certificates from the Center for Science and Mathematics Educational Research (CSMER) from the University of Puerto Rico, Rio Piedras Campus. Below if the full schedule of talks. You are also welcome to download and share a version of this flyer.